Few cities worldwide have as wild a reputation as New Orleans, which, each year, is flooded by millions of spring breakers, second liners, newlyweds and retirees alike, all with the same goal: to eat well and drink even better. Whether you’re just blowing through or you call New Orleans your home, the chances are good that, some morning (or afternoon) you’re going to wake up with throbbing temples, a dry mouth and a raging appetite: You’re hungover. Luckily, the Crescent City offers no shortage of recovery zones, restaurants and cafés stocked with gut-sticking remedies, and, if you feel ready, tempting hair-of-the-dog options. Here are our favorite NOLA hangover cures. Located in the bustling Marigny, the recently opened New American pizza restaurant Paladar 511 makes a bold impression by occupying the ground floor of an industrial building. After a big night out, Paladar 511’s excellent pies—from California pizza masters Jack Murphy and Susan Dunn—will soon have you feeling brighter. Brunch selections vary, but always feature a perfectly runny farm egg, coddled by fresh ingredients like mascarpone and arugula or braised endive and ham. Located in the historic neighborhood of Riverbend, Carrollton Market’s Creole-tinged New American plates are divided evenly between buttery sweet dishes and...buttery savory ones. From the latter category, we favor the over-the-top brunch poutine: hand-cut fries topped with sausage gravy, cheese curds, crispy bacon and, for good measure, two sunny-side-up eggs. Elizabeth’s at brunch is a Crescent City classic: Come 11 a.m., the line snakes out in front of the white clapboard building, its vintage “Drink Regal Beer” ad momentarily rousing soured memories from the night before. Return those recollections to the vault as you focus all your remaining mental energy on the café’s impressively wide-ranging, waistband-expanding plates. One of Elizabeth’s most well-known dishes is the duck waffle, which doesn’t disappoint: a fluffy, tender cornbread waffle topped with sweet-and-savory duck and sweet potato hash garnished with red-and-green pepper jelly. As in any self-respecting Southern city, there’s no shortage of poultry-topped waffles in New Orleans, though the most inventive chefs are sure to put their own stamp on the classic soul food breakfast. 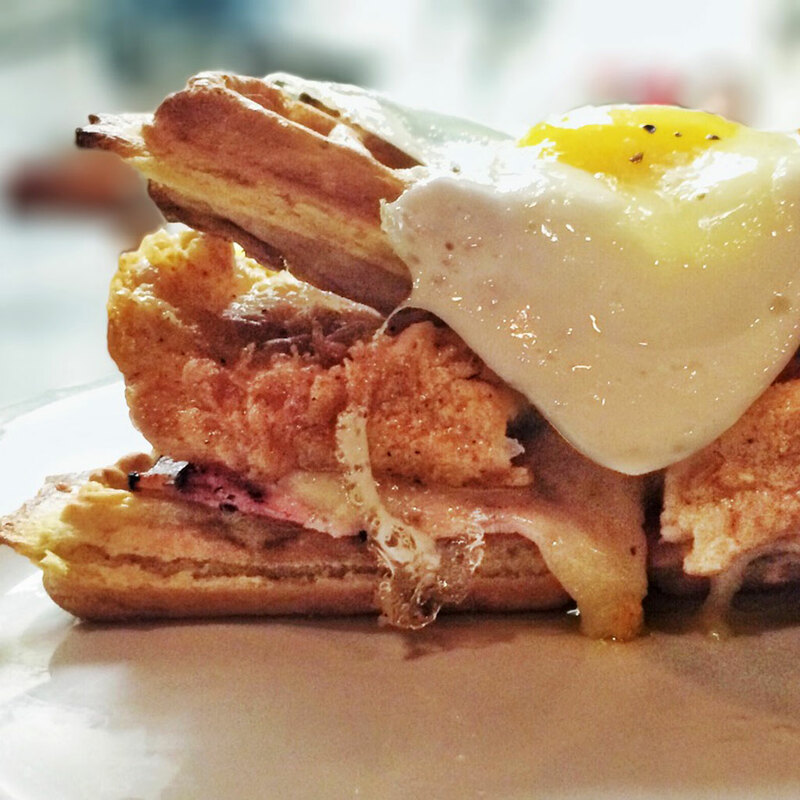 At Brown Butter, the kitchen staff does so literally, piling crunchy fried chicken, thin-sliced smoked ham, and white cheddar onto fluffy sourdough bread and then griddling the mammoth work of art on a waffle iron. The crisp waffle-panini is then drizzled with a syrupy mustard glaze whose spicy bite is sure to breathe some life back into you. In the evening hours, Dante’s, a Leonidas favorite located in a restored former home, delves deep into seafood, plating modern takes on Southern classics such as shrimp and grits, grilled redfish and seared Gulf fish. But on late weekend mornings, as the restaurant welcomes the bleary-eyed and ravenous, it’s all about smoky, savory bacon with fluffy biscuits and eggs in all their forms. Dante’s pain perdu is exquisite—instead of using stale bread as a base, slices of chilled bread pudding are re-soaked in custard and fried in butter for a meta French toast that’ll have you up and at ‘em in no time. There’s nothing quite like Surrey’s version of huevos rancheros to chase away the aches of the morning-after: black beans sandwiched between two giant, fresh corn tortillas, the whole shebang gets topped with mole sauce, pico de gallo, melted cheddar and two eggs any style. Pro tip: Ask for an add-on of Mexican chorizo. This popular Cajun café gets five stars from us for its elevated takes on classic Cajun and Creole fare: at dinner, seared Gulf swordfish gets a sweet peanut-ancho chile glaze, while sauteed drum fish is joined by braised fennel and cioppino broth. Come Saturday and Sunday, though, those with pounding headaches pile in for brunch, when eggs, biscuits and breakfast meats soothe with their sweet, sweet grease. Atchafalaya’s namesake eggs are the way to go here: two poached eggs seated atop rounds of fried green tomatoes, mounded with jumbo lump crab and doused in hollandaise, this take on eggs Benedict could, like the classic cocktail, be called a corpse reviver. This beautiful Chartres Street restaurant is a French Quarter gem, distinguishing itself from its many nearby competitors with its commitment to service and its inventive, stunningly delicious food. Accessed through the side entrance of a gas-lamp-lit historic building, Angeline’s impressive looks carry over to its plates both visually and flavor-wise. The restaurant’s brunch menu offers several compelling hangover cures, but our favorite is an indulgent composition of creamy Coosa Valley grits topped with a crispy cake of blood sausage and a fried egg, then anointed with red-eye gravy. Given the strength of Angeline’s cocktails—in terms of both execution and ABV—a hair of the dog is a must here: The violet-scented Last Aviator goes down nice and easy. When the consequences of last night’s drink fest hit hard, thank goodness for Compere Lapin, St. Lucian–born chef Nina Compton’s Caribbean-tinged bistro located in the Warehouse District. For the hungover jonesing for a sweet plate, the coconut French toast is perfect: thickly sliced, it’s doused in a rummy pecan sauce that will make you at least start to welcome the idea of someday getting drunk again. If you find yourself ravenous the morning after a night out on the town, Sylvain’s dinner-entree-size crispy pork shoulder is the dish for you: featuring two crunchy-then-tender cakes fashioned out of pulled pork, the plate is mounded with creamy grits, sauced with roasted tomato hollandaise, and crowned with two glorious fried eggs.